South Korea supporters react at the end of the Russia 2018 World Cup Group F football match between South Korea and Germany. 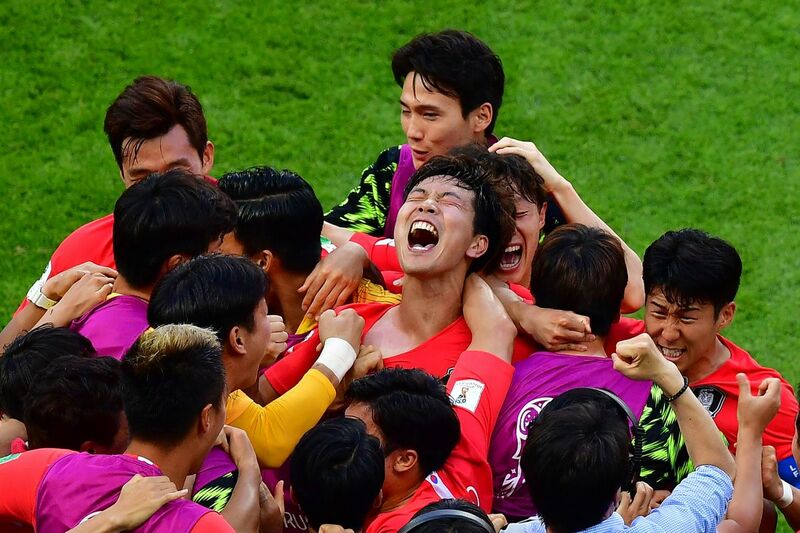 Mexican fans plunged into anguish Wednesday by their team's drubbing by Sweden were left cheering for South Korea -- exploding into celebration when the Asian side defeated Germany, putting Mexico into the World Cup knockout stage. Brimming with optimism after their team upset Germany in their World Cup opener and then beat South Korea, the fans back home in Mexico watched in horror as Sweden scored goal after goal in their final Group F match. With the clock ticking down at Yekaterinburg Arena and the scoreboard at 3-0, it appeared Mexico were about to be sent unceremoniously home from Russia. Suddenly, all eyes turned to the South Korea-Germany match being played simultaneously in Kazan. "Korea! Korea!" chanted fans in a Mexico City bar, leaping into the air and embracing when the Asian side scored a stoppage-time, VAR-assisted goal, and then a late second to seal the reigning champions' humiliating exit -- and allow Mexico to squeak through to the Round of 16. "I went from crying to laughing," said Cecilia Gonzalez, a 22-year-old student who was celebrating the outcome of the rollercoaster ride with tequila. "Thank you Korea. I don't even know quite where it is, but thank you, thank you." 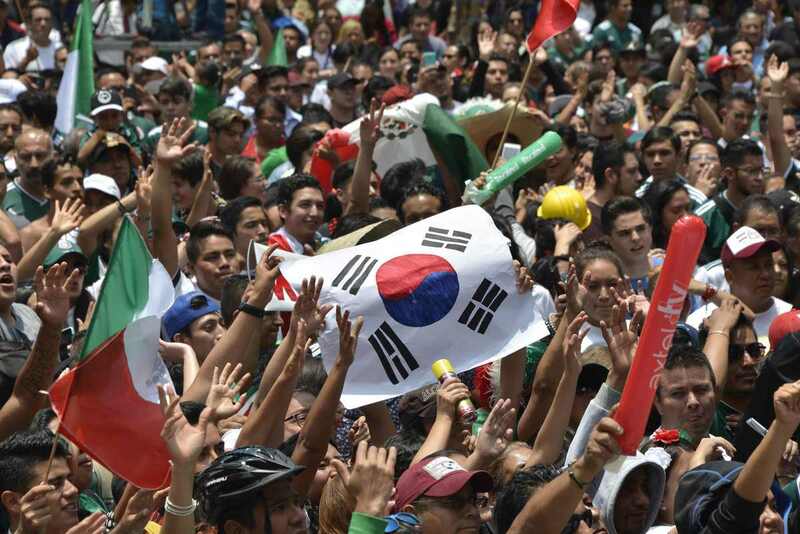 Some fans even flocked to the South Korean embassy in Mexico City to celebrate, chanting that Koreans are "our brothers." Social media in Mexico instantly erupted into memes: a Mexican in cowboy hat and boots dancing to "Gangnam Style," a fake news headline on Mexico changing its official language to Korean, Twitter users vowing to start listening to K-pop and watch more Korean dramas on TV. As for their own team, the fans' disappointment was palpable. "Mexico really let me down. My expectations were so high. They played so well in the other matches, it got my hopes up. But they didn't play like I thought they would," said 20-year-old student Cecilia Jimenez. "Mexico played very, very badly. Luckily the Koreans did us a favour," said Alan Gonzalez, 29, a lawyer. With its three goals, Sweden finished atop the group and will play Group E runners-up Switzerland. Mexico are stuck playing Group E winners and five-time world champions Brazil. "It's been going well for us so far. We beat the world champions, that's not so easy," said Luis Padilla, 29, a cafe owner in Mexico City, voicing cautious optimism that the team would continue bringing happiness to the fans back home. "This is a country that grinds to a halt for football. Football changes everything. It sets our national spirits," he said.